As M.E. Thomas says of her fellow sociopaths, we are your neighbors, co-workers, and quite possibly the people closest to you: lovers, family, friends. Our risk-seeking behavior and general fearlessness are thrilling, our glibness and charm alluring. Our often quick wit and outside-the-box thinking make us appear intelligent—even brilliant. We climb the corporate ladder faster than the rest, and appear to have limitless self-confidence. Who are we? We are highly successful, non-criminal sociopaths and we comprise 4% of the American population (that’s 1 in 25 people!). Confessions of a Sociopath is part confessional memoir, part primer for the wary. Drawn from Thomas’ own experiences; her popular blog, Sociopathworld.com; and current and historical scientific literature, it reveals just how different – and yet often very similar - sociopaths are from the rest of the world. The book confirms suspicions and debunks myths about sociopathy and is both the memoir of a high-functioning, law-abiding (well, mostly) sociopath and a roadmap – right from the source - for dealing with the sociopath in your life, be it a boss, sibling, parent, spouse, child, neighbor, colleague or friend. As Thomas argues, while sociopaths aren't like everyone else, and it’s true some of them are incredibly dangerous, they are not inherently evil. In fact, they’re potentially more productive and useful to society than neurotypicals or “empaths,” as they fondly like to call “normal” people. Confessions of a Sociopath demystifyies sociopathic behavior and provide readers with greater insight on how to respond or react to protect themselves, live among sociopaths without becoming victims, and even beat sociopaths at their own game, through a bit of empathetic cunning and manipulation. Thomas’ own experiences; her popular blog, Sociopathworld.com; and current and historical scientific literature, it reveals just how different – and yet often very similar - sociopaths are from the rest of the world. The book confirms suspicions and debunks myths about sociopathy and is both the memoir of a high-functioning, law-abiding (well, mostly) sociopath and a roadmap – right from the source - for dealing with the sociopath in your life, be it a boss, sibling, parent, spouse, child, neighbor, colleague or friend. As Thomas argues, while sociopaths aren't like everyone else, and it’s true some of them are incredibly dangerous, they are not inherently evil. In fact, they’re potentially more productive and useful to society than neurotypicals or “empaths,” as they fondly like to call “normal” people. 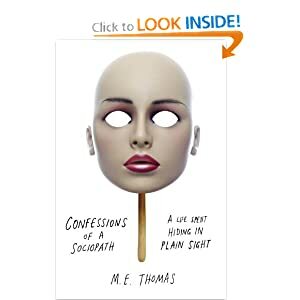 Confessions of a Sociopath demystifyies sociopathic behavior and provide readers with greater insight on how to respond or react to protect themselves, live among sociopaths without becoming victims, and even beat sociopaths at their own game, through a bit of empathetic cunning and manipulation.